The following review is for a product called Forskolin Fuel which, according to the manufacturer, can help you lose weight when combined a smart diet and exercise program. It claims the source plant, Coleus Forskohlii, has been used as an ayurvedic remedy for centuries and purportedly supports cardiovascular, respiratory and metabolic function. It does not cite any studies to back up these claims. Forskolin Fuel contains 100% pure standardized 20% Coleus Forskohlii Extract and each serving contains 125 mg which the product website notes is “as recommended” without indicating by whom. As with many supplements it contains no preservatives or artificial colors. It is produced in a cGMP certified laboratory. After thorough research, we were unable to find a manufacturer recommended dosage. There are no side effects noted for this product. However, it can be inferred at least, that the dosage is one capsule a day given that there are 30 capsules in a bottle and a bottle is noted to be a one-month supply. The manufacturer recommends that you consult your doctor or pharmacist before purchasing or taking any supplement especially if you are pregnant, nursing a baby or have a chronic medical condition, like, diabetes, hypertension or heart disease. 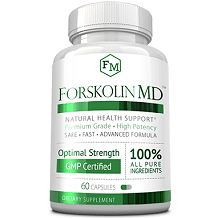 One bottle of Forskolin Fuel, containing 30 capsules and available from the manufacturer’s website, cost $48.00 at the time of our review. If you were to buy three bottles it would cost $32.00 each while a purchase of five bottles would set you back $28.80 per bottle. The multi-unit options each include free shipping. 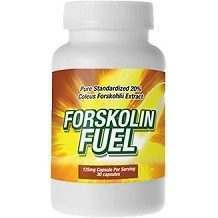 Forskolin Fuel accepts only unused and unopened items for refund. Returns must be received within 90 of purchase. This obviously makes it impossible to test the effectiveness of this product. Other than the fact that returns are accepted at all (and even then, only for unopened product) we did not much in the way of redeeming qualities of this product. It is costly relative to other Forskolin products, it does not come with a specified dosage and makes a lot of claims about its product without really citing anything to support them. We think you may do better looking at more competitive products.